L. Sisymbrium officinale, Erysimum officinale, Ar. carmc (all good), F. herbeauxchantres, Eng. common hedge mustard, Singer's Plant, St. Barbara's Hedge Mustard. English watercress. The Spanish name for this herb is derived from Arabic, while the French meaning comes the plant’s fame in being the infallible cure for loss of voice until the time of Louis XIV. Strong infusions of hedge mustard were taken for all throat problems.The plant is used as an expectorant, stomachic and diuretic. It cannot be said that the Arabs brought this plant for it grows wild everywhere in a Europe, on wasteland and along roads. 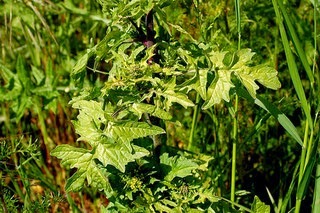 It is a most troublesome weed, growing four to six feet high and a dust collector. In Spain hedge mustard is so abundant that there are rivers and towns named for it: the Jarama and Jaramilla Rivers, and the towns Jaramillo de la Fuente and Jaramillo Quemado in Burgos. Poets, over the centuries, however, praise its purple-hue, the toothed segments of its hairy pinnate leaves with toothed segments and its tiny yellow flower clusters blooming from April to November, under these are seed pods bearing yellow seeds resembling mustard. The stem looks like and cuts like broccoli, its relative as both belong to the Brassicaceae or Mustard family. Andalusia still has some recipes using it but the Canary Islands seem too have taken over the tradition where Hedge Mustard Pottage is renown. Vilanova recommended it for seasoning meats in the winter. Hedge mustard should not be confused with wild radishes (rabanillo), which have singular flowers while mustards have a clump of flowers. 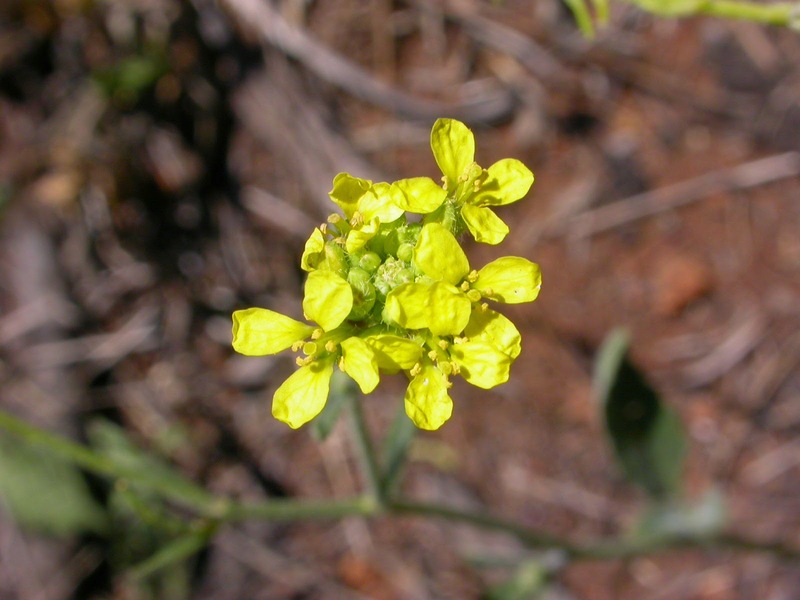 The petals of the radish flowers are veined, mustard flowers are not. The seed pods of the radish are segmented, the mustard pods are not. Also wild radishes tend to grow to one or two feet high, maybe three. 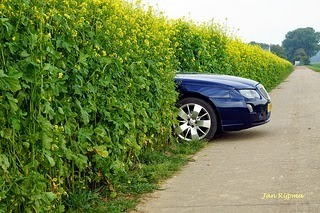 Usually just with a glance you can tell if it is a field of radish or mustards.